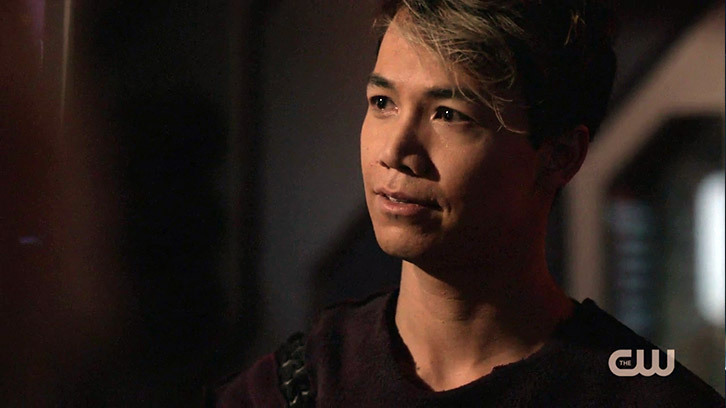 The 100 - Damocles - Part Two - Review: "Time For Bed, And A New Frontier"
In my review of the first episode of The 100's Season 5 finale last week, I mentioned that historically one episode is rather bad, while the other is really good. Said history rang true again this time round, and though "Damocles - Part Two" took a bit too long to really get going, the wait was definitely worth it. Jason Rothenberg wrote this final episode, with Dean White directing. Opening this hour in the Wonkru triage away from the front line was a smart move. Rothenberg and White did well to convey the desperation among the able-bodied and casualties. The other thing they did perfectly was move Octavia out of the way with no fanfare or fuss. 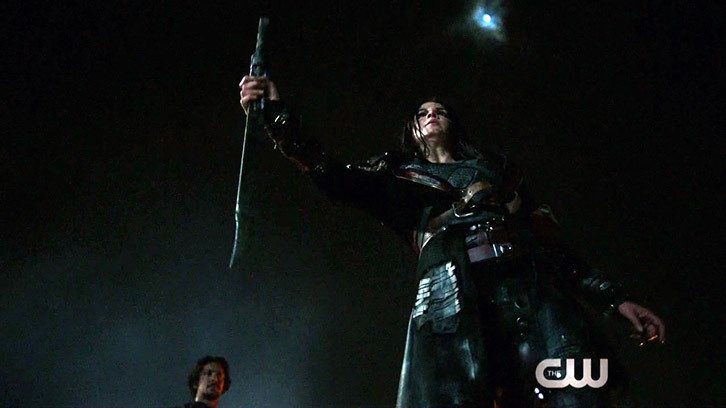 When Madi arrived back with a wounded Gaia, along with Bellamy, Octavia, Indra and Murphy, Octavia wasted no time laying down her sword and bowing to the Commander. Immediately, everyone else there also pledged their allegiance to Madi in what was likely the best display of unity in this entire season. I think many would agree that some minor conflict here should have been on the cards as the leadership changed hands, but for the sake of the story, keeping this part of the episode clean and civil was a very smart play. 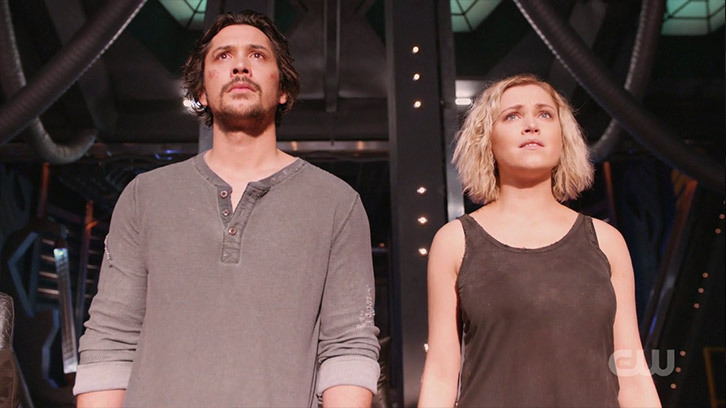 Madi was instrumental throughout the hour as a result, and though initially looking like a cat in headlights, with Bellamy's wisdom in Clarke's absence she formulated a plan to retake Shadow Valley. What followed was the worst part of this episode. The complete farce that was the war in the gorge essentially repeated itself, though this time the rover was used to better effect to neutralize the deadly cannons Eligius used to decimate the Wonkru army last week. Why the showrunners opted to arm Echo with a bow and arrow and have her pull off some fluke shots to disable said cannons will likely never be known, but fortunately the war for the gorge was resolved very promptly this time, and the Eligius soldiers offered no resistance after they'd fallen back to the village. 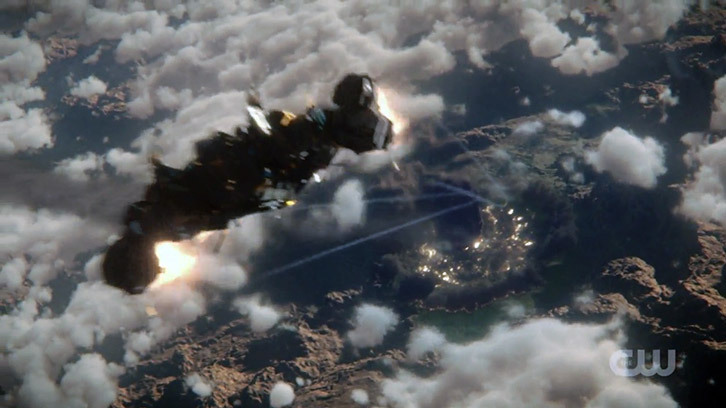 Around the same time, Raven and Shaw were being tortured because McCreary wanted to get the drop ship airborne so they could destroy the remnants of Wonkru. Somehow still moving about unsupervised was Clarke, who freed Diyoza in order to put a stop to McCreary. In a complex but clever play, she threatened Diyoza's unborn child instead of Diyoza herself. Once radio traffic confirmed that the war in the gorge was all but over, Clarke pretended to switch sides by zapping Raven's shock collar after indicating to her to grab McCreary before she did so. Shaw and Clarke then neutralized the remaining Eligius prisoners. This was too little, to late for Earth, however, because McCreary followed Diyoza's playbook and launched the Damocles bomb remotely, sending it hurtling from the mothership orbiting above towards the valley. The 14 minutes to evacuate everyone into the drop ship wasn't handled well because it was another unrealistic element to this two part finale which could have been avoided. 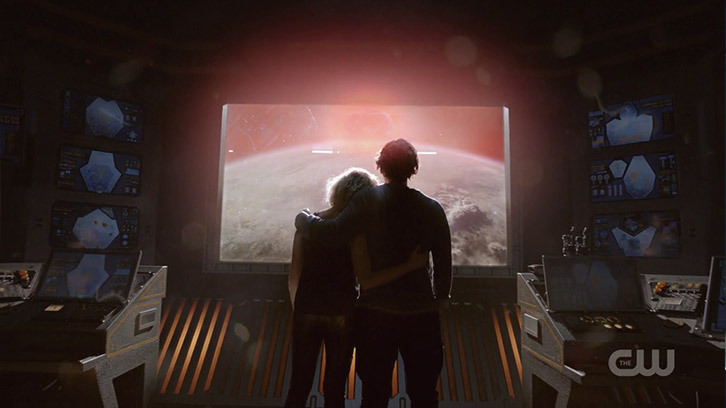 I'm certain I wasn't the only one who wondered whether Clarke would stay behind with Bellamy and whoever was yet to reach the drop ship, but I was seriously relieved that we weren't about to see a fourth season finale repeat. For once, everyone got where they needed to go, and Raven and Shaw were able to steer the drop ship upwards to the Eligius IV mothership. It was at this point that I noted with surprise that we were barely 60% through this final episode. Part of me was pleased because at least whatever was about to happen wasn't likely to be rushed, but another part was nervous because things were about to change big time. And change big time they did. With limited rations on board, the leaders from both the prisoners and Wonkru came together to decide that using the available cryosleep facilities on board Eligius IV was the best option to allow Earth to recover from yet another radiation event thanks to the Damocles bomb, and, of course, to pass the time. Soon, everyone was in their pods asleep, but some of the most moving storytelling this series has seen was imminent. Out of the blue, Clarke and Bellamy woke up. They met a new character named Jordan, who introduced himself as the son of Monty and Harper. From there, an amazing series of events unfolded which revealed that Monty and Harper had made what could be said as the greatest sacrifice of them all. Monty and Harper stayed awake, opting to firstly wait on Earth to heal, but after that failed, Monty spent decades trying to find out what the missing Eligius III mission had set out to do. Turns out that they were sent to mine oil on another planet after Earth's was depleted. Sensing no other option, he and Harper put Jordan in cryosleep with instructions on what to do when he woke up. He did as he was told and played his parents' heart-warming video diary, which revealed their sacrifices as they grew old knowing they would never see the planet to which they were sending the last known humans in the universe. 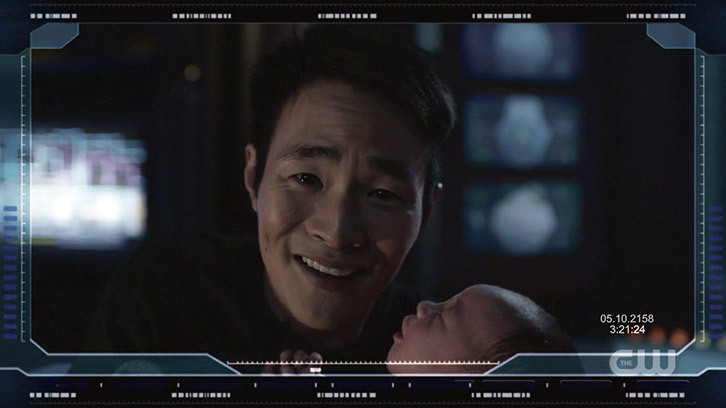 Further, Monty and Harper instructed their son to wake only Clarke and Bellamy to tell them the news that their new home was in sight. The pair embraced as their new frontier awaited them. On the bright side, at least they're well rested for what lies ahead. With the story capped off, let's analyze what the characters went through to get this far. We've been here before, Madi. We were the criminals, The Hundred. We landed in someone elses home, and we went to war. You can execute them because the're the enemy, or you can break the cycle. You can be better than them, you can be better than us. The choice is yours. That's a beautiful segue into Bellamy's development in this hour. In a reversal of the Season 4 finale, it was him who was just about to stay behind as he waited for the final survivors to make it to the drop ship before the doors closed. Though he imparted some wisdom onto Madi, she returned his favor in beautiful fashion, providing some counterpoints to his displeasure with Clarke for her actions as of late, comparing the mistakes Clarke had made to his own when looking out for his sister. She also went as far as to reveal that Clarke had tried to reach him over the radio daily while she was on Earth and he on the Ark. Though we're far from a romance yet, knowing this changed his perception of Clarke right then and there, and that renewed relationship will be instrumental as they face this new frontier together. I love you big brother. I know you love me too. I get the feeling a sizable burden has been lifted from Octavia's shoulders now that she's handed over the Wonkru leadership to Madi. She was in the background of the finale from then on, but a beautiful moment between her and her brother confirmed Bellamy's ongoing displeasure with Octavia's actions across the season. Before they went to cryosleep, Octavia told Bellamy she loved him, but he was less forthcoming. I thought his honesty was admirable here, as he admitted that as she was his sister a part of him would always love her, but that a part of him also wanted her dead. Octavia rightly took that on the chin and accepted his view. I believe a big part of her development in the next season will be to earn back the trust and love of her brother. She also has a fantastic role model in Diyoza, and they share more in common than they realize. Some interesting words were exchanged between them shortly after the drop ship took off. Clarke has undergone a lot of development this season, but it was rightly held back somewhat during both finale episodes. I thought it was great to see her quick thinking and calm demeanor in play yet again as she wrestled back control of the drop ship from McCreary. She still loves Madi dearly, and I don't think Clarke understands quite how large of a free pass Madi gave her when she ordered Bellamy to not be mad with Clarke. Echo is still in the picture for Bellamy, but Clarke's had a decidedly lean season in terms of love interests if Madi doesn't count. Maybe she might see something in Jordan, though something would probably feel off about that. No other characters received meaningful development in this finale. Abby was hardly seen aside from a short but sharply executed moment between her and Octavia, and Kane's fate is still up in the air. Gaia inspired Madi to ask the former Commanders for guidance, but did nothing else. Indra also did nothing. Murphy managed to get wounded in the second assault on the gorge, and this prompted Emori to admit she loved him, which came somewhat out of the blue but felt right in its own way. Echo was instrumental in the same assault, but did little else. Raven and Shaw did their jobs aboard the drop ship but nothing much else happened between them. Diyoza also had a quieter hour than expected. One cannot forget Monty and Harper, however. Though light in present day content, I thought their send-off was beautifully done. When you think about Monty's time on this series, he's always worked hard in the background for the benefit of his friends. He may not have had to make the tough decisions like Clarke or Bellamy has, but he's always stuck with the plan and got the job done. Harper was a second season addition to the series, and to Monty's life, and I've enjoyed every moment they've shared, and the reason the moments they've shared this season seemed to have a little x-factor and spice can be put down to their impending farewell in this finale. What's great about Monty in particular is that he will leave perhaps the greatest legacy yet. The showrunners have had a practice with Lexa's legacy being a recurring theme, but Monty can be solely credited for guiding the last known population of humans to a potential sanctuary, and he needs to live on. I'd think naming the new planet in his honor would be the least they could do, especially given we had a Camp Jaha in the third season, and here's hoping he might pop up in a few more video diaries in which he leaves instructions on how to maintain the algae farm and other such things. We also have Jordan, too, which is a great start. I also hope we learn a little more about Monty and Harper's time alone. They could have woken someone or everyone up part way through at any time to ask for advice, keep people updated, and for their own support and wellbeing, whether it's for company or for ensuring their baby is healthy. I'd love to be able to understand their thought processes behind those sorts of decisions. This season had significantly fewer poor episodes than previous seasons, with the back half episodes being far better overall than usual. The Eligius prisoners and Diyoza were by far the best antagonists this series has had. This season had significantly fewer poor episodes than previous seasons. The reduction in venues to just Polis and Shadow Valley aided simplicity and continuity, which enabled better overall storytelling and character development. Madi has exceeded my expectations for the character's use and development. This is about as good an example of a new character introduction that I've seen. Hopefully Jordan sees the same good fortunes. It's surprising that the worms Octavia was breeding and that were later discarded by Clarke never featured again. This was for the better, however. I'm by no means a fan of the Flame and associated storylines, but by leaving the Flame's history behind and focusing on what it can do for Madi has swung me towards wanting to see it continue, but only in its current format. Children are very rarely seen in this series, so it's a surprise that this season featured two pregnancies. My final point deserves a paragraph because it's really significant to me, and to the series as a whole, I believe. In my review for this season's seventh episode, I discussed at length that I believed the showrunners were changing direction by trying to move the characters away from conflict. Fittingly, this came about via Monty's perspectives on life shifting thanks to the suicide note left to him by his good friend, Jasper. It might have gone largely unnoticed to some in this finale, but out of nowhere we had members of Wonkru and Eligius in the same drop ship within 15 minutes of fighting with each other. That's pretty significant, and thanks to Madi's leadership of Wonkru and Bellamy's words of wisdom which swayed her away from having the Eligius prisoners executed, we finally have one side of the coin not about to go to war, and now that McCreary is out of the picture, with Diyoza likely resuming charge, Eligius also share the same view. Because of the nature of this series, it goes without saying there will be a few fights and what not on the new planet, but so long as it's not the default answer to everything, that's significant progress, and more closely aligned with what I want to see which is a society thriving instead of merely surviving. In all, this has been the best season of The 100 since the first season. There's plenty more that I've enjoyed in this season than I haven't, which is really good to see. As a series ages it also needs to evolve and mature. Evolution hasn't been an issue with this series - if anything it's evolved too fast given where things began. Maturity is more important to me, however, and it's harder for showrunners to do. With the change in tack being signaled as described in my previous paragraph, The 100 is finally beginning to mature. We're moving away from the same old same old, and towards a better, more consistent, more enjoyable series. I'm going into Season 6 with a much better mindset than I headed into Season 5 with. April 2019 seems like a long way off. As always, thanks so much for reading this review, and my previous reviews this season. It's been great fun writing them, and I really hope you've enjoyed reading them. I'd love to hear what you thought of this finale, and the season as a whole, so be sure to head down to the comments below and join the discussion. Until then, I'll see you all right back here in 2019.